I know that this is not a new idea, for we have all heard the story of the tortoise and the hare since we were little. Slow and steady always wins the race. But it is so easy to forget it when most of what we read in the financial press is written to sell magazines. Slow and steady does not sell magazines. Having seen the damage that is caused by always looking for the next hot investment, I have been really interested in this idea of slow and steady investing. I love the term “slow capital” that I first heard from Fred Wilson. 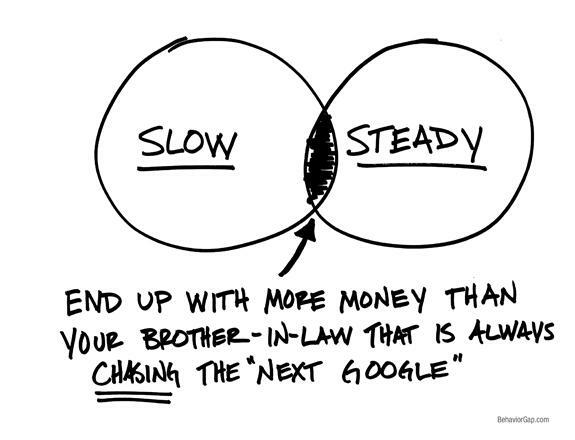 I would also add “steady.” Slow and steady capital comes as close as possible to describing my ideal investment process. 1. Slow and steady capital is far more concerned with avoiding large losses than with chasing the next great investment. Being slow and steady means that you are willing to exchange the opportunity of making a killing for the assurance of never getting killed. 2. Slow and steady capital means you can have a life. If you accept the fact that slow and steady wins the race and you find a way to invest that way, you can turn off all the noise of Wall Street. A friend of mine in emergency medicine used to tell me that he never knew whether to laugh or cry when he would go run in the mountains behind the hospital during lunch while all the other physicians were huddled around CNBC, as if Jim Cramer was about to reveal the secret to endless wealth. Slow and steady capital allows you to ignore that noise and enjoy your life. 3. Slow and steady capital knows that the goal of investing is to have the capital you need to fund your most important goals. If your goal is to have something to talk about at the next neighborhood party, try something else. 4. Being slow and steady is hard because it always seems that someone is getting rich quick. A few years ago I had a conversation with a client-to-be who told me that he had done pretty well with an aggressive trading strategy. Now, I have heard that enough times over the years to know that we all have selective and short-term memories. Sometimes it only takes a few winning trades for someone to forget the losers. That was the case here. After talking about it for while, we discovered that in just the last few months things had gone well. But it was on a much smaller capital base, because the client-to-be had lost around 50% in 2008. So if you decide to be slow and steady, remember to take ALL stories of people getting rich quick with a huge grain of salt. Slow and steady capital: short-term boring, long-term exciting. A version of this post appeared previously at The New York Times. Carl Richards is a financial planner and the director of investor education for the BAM ALLIANCE, a community of more than 130 independent wealth management firms throughout the United States. Visit Behavior Gap for more of Carl’s sketches and writings. Carl does not own shares of any companies mentioned. The Motley Fool owns shares of Google. Motley Fool newsletter services have recommended buying shares of Google. The Motley Fool has a disclosure policy.